I realized, after having someone recently ask me about basic shamanic techniques, that I really haven’t written much about the foundational nuts and bolts of what I do. I suppose it’s another case of me assuming that readers already have the basics of (neo)shamanism under their belts; it’s actually more of a challenge for me to write something on that most basic and bare-bones level because I have to think hard about things I normally take for granted. So I’m going to take a shot at explaining the basics of how I do drum journeying, and some starter points for readers as well. I’ve enjoyed dancing at drum circles for many years now. Dancing and drumming are effective forms of trancework for me, but trying to keep an eye on other dancers can be distracting, never mind dodging the occasional drunk person with poor boundaries. So I’ve learned to drum solo for my own personal shamanic work. It took some work, since I hadn’t really been a drummer before, but with practice I learned to go into trance while dancing (or sitting) and drumming, and now the action of drumming is closely interwoven with the trance state. The rhythm of my body beating the drum helps to lull me into the initial trance, and helps carry me deeper with physical cues as I drum faster or slower, louder or softer. Drumming is one of the most common forms of trancework in shamanic practice; most (though not all) shamanic traditions worldwide incorporate drumming. Sometimes the drum is only a tool; other times it’s a vehicle to the otherworld; and still other drums are the map to get there. While shamanic drumming does rely some on keeping at least a very basic “heartbeat” rhythm, you don’t have to be a virtuoso. Also, it’s wonderfully universal experience; while their perception of the percussion may differ somewhat from hearing peoples’, those who are deaf can also make use of drums, shamanically and otherwise. You may already have some experience with trancing while drumming. If not, the first thing you’ll want to do is to practice altering your state of consciousness to the sound of drums. There are lots of drumming CDs out there, and you can also find some free videos by searching for “shamanic drumming” on YouTube. If you’re lucky enough to have a drum circle near you, you can even listen in person; a lot of them won’t have a problem if you don’t drum yourself, so long as you aren’t disruptive. You can, of course, drum as well, but the main thing is to practice “sinking into” the drum beats regardless of whether you yourself drum or not. Deerskin drum and beater by Lupa, 2012. You will also want to practice drumming itself. Play with your drum; try out different beats, and see how each part of the head sounds–the tone near the edges may be very different from that in the center. Really listen to the drum’s voice and get to know it as an individual. Don’t worry about being technically proficient; don’t even necessarily worry about keeping a perfect beat, either. Just play with it and see what happens. Once you feel comfortable enough with both skills, try bringing them together. You can drum at the drum circle, or drum by yourself and ride the rhythm you create. And most of all, practice, practice, practice. Nothing replaces that. You may find that you dip a bit into the spirit world as you’re practicing. That’s okay. Generally you’re not going to go in deep enough at this point to get in any trouble. If you have trouble “coming back out” again, ground yourself by getting up and walking around a bit (with company if you feel a bit wobbly) and eat something protein-heavy to settle your body down again. What sort of drum do I use? My personal choice has always been natural hide drums. 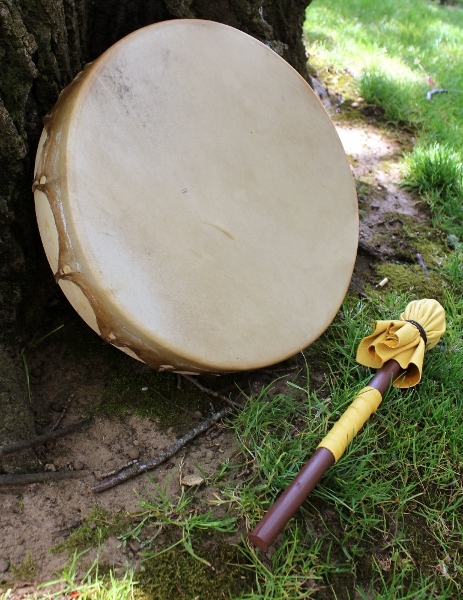 My first one was a goathide bodhran, but my current journeying drum is a horse hide frame drum that I got after completing my first year of intensive Therioshamanic work. Horse has long been a totem of travel and protection for me, so it was fitting that the horse hide drum was the one who chose to work with me. Not only do I work with the physical drum, but also the spirits of the horse and yellow cedar whose physical remains create the drum, and the deer whose leg bone is the beater. She has a deeper voice, but varied, and I’ve gotten to know her voice well enough that I can play her without even looking at her and still know exactly where to strike to get the right pitch. The spirit of the horse hide is also the ones who carries me to the spirit world. It’s safer to have a guide to take me there, and she has been known to rescue me when things got a little (or a lot!) too risky. She can move much more quickly there than I can, and can sometimes gain entry to places that I can’t go by myself. Plus it takes effort to move around, even in the spirit realm, so having someone to take the first leg of effort allows me to reserve my strength for once I arrive. There have even been times I was so tired afterward that she was the only thing getting me back home safely. There’s a wide variety of drums out there; each with its own voice and playing style. A djembe is going to have a different personality than a bodhran, and they’re played differently, too. 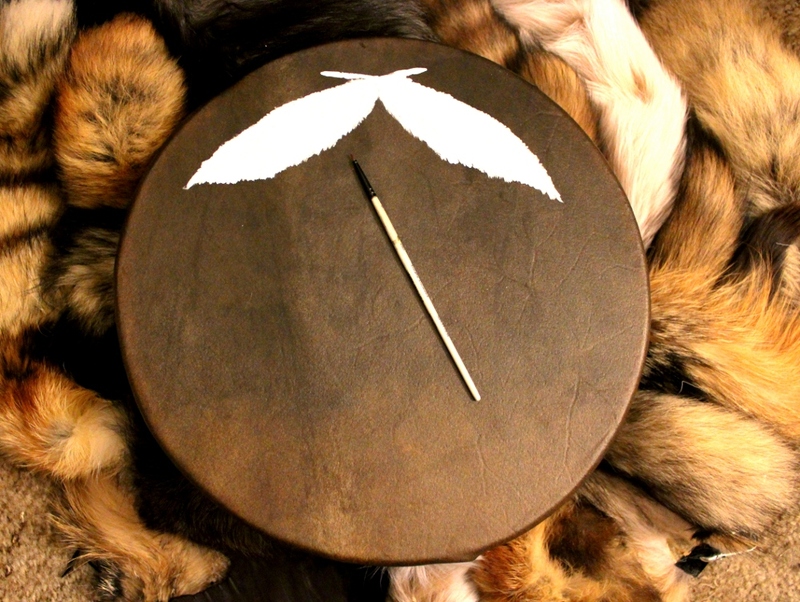 If you’ve spent some time at a drum circle you may already know what type of drum you prefer. However, if you’re still unsure, go to a drum circle or shop and check out how each is played. If you don’t have access to a drum circle there are videos of some on YouTube, though it may be tough to figure out which drum has which voice. And the same if you need to order your drum online–you can search for each type of drum and generally find lots of videos of people playing them. One other consideration: despite my love of hide drums, I have occasionally regretted not having a synthetic drum as a backup. Hide drums don’t like moisture, and if I’m at an outdoor festival where it’s raining, my horse hide drum is going to sound flatter than a dead tire. Some people dislike synthetic drums because they’re, well, synthetic. However, you can imbue a synthetic drum with spirit in much the same way as vegan skindancing. Whether you buy or make a natural or synthetic drum, or even make one out of common household products, the important thing is that you have a good connection with it. You may find that it takes you a couple of tries to get the right drum. Just make sure that your old drum goes someplace where it’ll be appreciated. Consider making it a gift to a friend, or donating it to a music program for children. How do I warm the drum up? If you’ll forgive the slightly risque comparison, even drums need a little foreplay. Some of this is to get an idea of what the drum needs–is it too humid? Too warm?–as well as to tone up head and your arm! More importantly, it’s a greeting to the spirit, who may be sleeping. And it’s just plain polite. I first warm my drum up by rubbing my hand over it in clockwise circles, starting at the outer edges and spiraling inward. As I do so, I quietly call to the spirit of the drum, and ask her to wake up and join me. Once she’s ready, I pick up the beater and run it over the drum in the same pattern–not hitting the drum, just moving the head of the beater over it. I also cool down my drum in the same way; once I have finished drumming, I run the beater over the head, only counterclockwise and moving out in spirals from the center. I then do the same thing with my hand, and if need be put the spirit back to sleep. If your drum is one that needs tuning, now’s a good time to check. You can also look for damage and other maintenance issues. I like to treat my horsehide drum with mink oil to keep the hide hydrated and conditioned, and to help waterproof it a bit. What sorts of drumbeats do I use? Honestly, I’m a fan of single beats. The tempo and timing may vary, but I’m happier with a drum that I just hit with one beater, rather than something like a djembe that is elaborately played with two hands. I like starting out with a “heartbeat”–a single beat rhythm that matches my own heartbeat. The heartbeat in the drum does connect to my own heart, which is useful for keeping me from completely losing the connection to my body while I journey. Once the horse spirit is ready, I start drumming along with her hoofbeats instead, for as long as I am riding her in the journey. After that, the drumbeats often follow either my heartbeat or my footsteps (or pawsteps if I’ve shifted in the journey). What happens when I drum journey? As mentioned earlier, I always start with the horse spirit of my drum arriving to carry me to the spirit world. My “starting place”, where I begin every journey, is one specific spot out in the Columbia River Gorge. So the horse will carry my spirit over the land to get to that place, and then drop me off there. From there I can choose to go down a number of paths, or even directly into the forest (though the paths are safer). As I am drumming, I can still feel my arms holding and playing the drum; the drum acts as an anchor to keep me from getting lost. And yes, sometimes my arms do get tired; I can feel it as I go through the spirit world, too, though I find if I rub my arms spiritually, it’ll help my physical arms, too. If I’m shapeshifted into a wolf or other animal in my journey, I can still feel the drum, though it feels sort of like a double exposure photo–both layers of “Lupa” are there, but they don’t quite match. As mentioned, the drumbeats often change to match what’s going on. Many times this isn’t conscious, except when I am deliberately using the drumbeat to call a helper, to get an emergency ride from Horse, to honor a being, etc. Occasionally I’ll need to stop drumming entirely, if I m in a place in the spirit world where I need to be quiet. I still hang onto the drum, and as mentioned the basic heartbeat that I start and close every journey with allows my physical heart to beat in lieu of the drum as needed. I still resume drumming as soon as I can, though, as it helps keep me focused on the journey. How do I care for my drum? I mentioned earlier that I use mink oil to condition the hide. I also keep the drum out of damp places, and if it gets wet I air-dry it as quickly as I can. Unfortunately, I’ve had situations where a cup of water got dumped on a hide drum, and the entire thing had to be redone, so be careful around water! Spiritually, sometimes I play the drum just for the sake of playing it. It’s a good bonding activity, and keeps us both in practice. she hangs out under my Bear altar, and while i don’t give her any special offerings (she just wants good basic care) you’re welcome to make offerings to you drum above and beyond keeping it in good condition. Some people like to purify their drums before and after a journey, and if the spirit of your drum is injured during a journey, make sure you tend to it before the journey is done. What if I need to change the drum’s head? Limited repair may be done to a drum head. Very small (pinhole sized) holes can be filled with a good epoxy; let it dry at least 24 hours before testing the playability. Be aware that this may not stop further damage to the hide once the stress of playing starts again. Beyond that, you’ll almost certainly have to replace the head. Even with the best of care, eventually everything wears out, even good quality hide drums. If your drum’s head wears out or is irreparably damaged consider it not just a swap of materials, but a changing of the guard. First, consider what worked well with the drum head you had, physically and spiritually. Do you want a similar one, or do you want to try something entirely different–a new hide, or even a synthetic? Do you feel you can change the drum head yourself, or do you want someone else to do it? If you’re changing it yourself, treat the old head with reverence. The spirit’s not gone or dead; the form is just too damaged for its present purpose. Thank the spirit for its service and help and ask it what it would like to do next. Some may like a nice retirement, while others may wish to be incorporated into other projects. If the drum head is big enough and the damage is close enough to one edge or another, you may even be able to put the undamaged part on a smaller frame. Make sure that the spirits of your frame and the new head are introduced before you put them together. You may even wish to let them sit next to each other for a few days before prepping the head to be stretched on. You may also wish to have the old head there as well, so it can pass on its experiences to the new one. When you put the new head on, have a conversation with it about what you do and how it can help. See if you can identify the nature of the spirit in it. Ask it if it would like any particular offerings or other special care. Once the new head is completely dry, take the drum out for a “test run”. Play it just to get to know it as you did with the old head, learning the voice and feel of it, then proceed from there. Delicately moving across this drum. Translucent claws tapping against taut-stretched hide. With my paintbrush made of birds. A long time ago, the world was a lot different than it is now. There were no seasons, no changes in the weather. If you wanted snow, you had to go to one part of the world. If you wanted sun, you had to go to another. And everybody had to bring back rain from the only place in the world that had it, though it got enough for everybody. Since the animals couldn’t only have rain or only sun, there was a lot of moving around, and you didn’t have so many animals who stayed in one place. Some animals hardly ever saw another of their kind, but others would organize reunions every so often so as to not get lonely. So it was that every seven years, all the foxes of the world would come together in one place for one great conclave. Long-separated friends caught up with each other, families introduced their youngest kits, disputes were addressed and resolved, and at night there was much celebration to be had. It was all rather a busy affair, as one might imagine would happen with that many foxes in one place. It just so happened that one year, there was a contest over which fox was most beloved by the Earth, who gave the foxes’ paws somewhere to go. Finally, it came down to White Fox from the North, Black Fox from the East, Red Fox from the South, and Gray Fox from the West. Everyone agreed that these were the very best, cleverest, swiftest and strongest foxes of them all. They spent an entire day debating who was going to be elected the best fox when the Earth would make her presence known that night. They had heard that the very best fox would receive a special gift from the Earth, and they each wanted to prove they deserved it. “She’ll choose me,” White Fox said, “because I am the only one who holds the cold snow and ice with my tall, proud mountains!” And everyone agreed that his mountains were indeed quite impressive. “Nobody likes being cold, silly thing,” said Black Fox. “She’ll choose me, because I carry the soft, warm winds that help new seedlings to grow.” And all the foxes assembled thought she made a very good point. “Ha! Just a little warmth? I’ll give you all the warmth you need with all the sunshine you could ever want!” declared Red Fox. “That’s why I’ll be chosen!” There was a good deal of agreement with that, as basking in the sun was a favorite activity of foxes all over. “Surely we cannot have any snow or plants or cooling off from the sun without rain,” said Gray Fox. “I have the most water, which means that I’m sure to be the one the Earth will choose.” And the other foxes licked their chops at the thought of cool, refreshing rain water to drink. But who would be chosen? The four foxes fell to arguing amongst each other, and had almost come to blows when there was a great trembling beneath their paws, and the Earth made her spirit present as a great, glowing golden Fox. “Dear children, what are you doing?” she asked. “We were trying to figure out who you were going to choose as your favorite fox, and we can’t all be your favorite!” the four foxes said. The Earth thought a moment and looked at each of the little foxes at her feet, each one so strong and talented in her or his own way. Then she smiled. “Of course you can all be my favorites. Why choose one among you when all four of you have so much to offer? My lovely Black Fox, you are the deep, rich soil which allows all the plants to grow healthy and strong. You take what has died and rebirth it as new living things. Your warm winds help to bring life to the land. Therefore, I will give you the first part of the year, when my friend the Sun is on his journey back here. And you, bright Red Fox, you give the Sun a place to show us his strength the best. You allow him a place to set down the burden of rays on his back, and unwrap them so that all of us may see them and enjoy their warmth. To you, I give the second part of the year so the Sun may share with us every year. Dear Gray Fox, your rains are invaluable to us all; without water we would be parched. I give you the third part of the year, where your rains may be the tears that bid farewell to the Sun as he leaves again, and your bright colors will be reflected in the leaves of the trees as they wear their finery to see him off. And so it was that every year after that, all the places of the world received the gifts of the four foxes, each one in turn. Of course, each Fox had her or his own favorite places where they might tarry a little longer. But the animals no longer had to travel so far just to get sunshine or rain, or to get out of the cold or the heat. And so all but the most adventurous were able to settle down and create nests and dens, and allow the seasons to come to them. So I’m in the process of writing a new book; it’ll be on totemism, but it’s going to be something of an experiment–and that’s all I’m going to say right this moment 😉 Also, in case you missed it, I have an article on animal parts and paganism on Witchvox this week. Anyway, I was paging through my previous books about totemism and animal magic in preparation for working on the new book, and I read over the part in Skin Spirits where I talked about vegan alternatives to using actual animal parts. It seems a little odd to sandwich that into a book all about using dead animal remains for magical and spiritual purposes, but really, the basic principles in the book apply even if you don’t have actual animal parts to work with. Since not everybody has rushed out to buy the book (not that I would complain if you did! ), and since I still really like this concept, I thought I’d share it here. See, it’s all about the spirits in the remains. The main spirit/soul of the animal departs on death, but what is left is a sort of spiritual “residue”, a haunt or memory if you will. It’s that which I work with when I do skindancing, or make artwork, or anything else involving animal parts. The actual work described in Skin Spirits, though, can really be applied to any animal spirit. Let’s take skindancing, for example. I started dancing in a wolf skin at Brushwood Folklore Center way back in 2002, and while the Pacific Northwest hasn’t yielded very many opportunities for dancing*, I still try to get out to dance when I can. (Sunfest next month will be my next known opportunity, and I’ve always loved dancing there!) Now, I’ve always danced in an actual skin; my first one has been retired, and I’m on my second, who hasn’t gotten nearly enough time out at the drum circles. The basic concept is the same regardless of what skin I wear, though: I am connected with the spirit in the skin, and with the more overarching totem, Grey Wolf in this case. The spirit in the skin helps to serve as a conduit for the totem, being closer in nature to that totem. (In my practice, I conceptualize totems as archetypal beings that embody everything about a given species, to include individual animal spirits.) So not only is the spirit getting a body to wear for an amount of time, but the dancer gets to experience a bit of what it is to be a wolf, or a deer, or a bear, or whatever animal is being danced. You don’t, however, need an actual dead animal for this, though. Vegan costumery can also work just as well. After all, look at the various animal masks made of wood and other plant materials in indigenous cultures worldwide. Are those going to be less effective in connecting to the totem or other animal being than fur or feathers? Perhaps there may need to be a certain amount of work to add to the plant materials what comes naturally in animal materials, but this can be done. Some would observe that the very act of creating the mask or other costumery in the image of the animal creates the connection with the animal; however, you can even go a step further and make the costume into a spirit house. Basically, you’re inviting an animal spirit that does not currently have any physical form to come and live in the costume you create. You can do this prior to creating it, during the process, or after; it all depends on how you want to make the invitation. Some people find that contacting the spirit beforehand and having its guidance during the creation process works well. Others may find that having a completed house ready is a better option, especially those who prefer to buy other people’s creations. How you invite the spirit in is up to you; while the actual trappings of the ritual may vary from person to person, the intent is to either invite a specific spirit in, or set a sort of “open house” sign up to invite a spirit of the appropriate species to take up residence. You can even talk to the relevant totem and see if s/he can connect you with an individual animal spirit to work with. There’s also the potential for “created” spirits. If you put enough energy into something, it can literally take on a life of its own, even if you didn’t intend it that way. (This resembles the concepts of servitors and egregores in Chaos magic, by the way, among other parallels.) If you’re going to deliberately go this route, talking to the totem can be very helpful in getting feedback on determining what qualities of the species to infuse into the costume as you create it or begin working with it. As to the actual materials? I’m a big fan of using secondhand things, so stuff like old faux fur coats works great. There are also manufacturers of fake animal teeth, claws and bones; the Bone Room has particularly high quality reproductions of a lot of different animal skulls. And if you’re artistic, creating your own out of various media is most definitely an option. What you want is to have something that you can wear while dancing or otherwise invoking the spirit and the totem, and something that the spirit can feel comfortable living in, a sort of movable shrine. Whether this is made of real animal parts or not, may you find it to be a highly effective connection to the beings you’re working with! Aha! I think I figured out how to keep you folks with RSS feeds from getting slammed with all the pictures! Let me know if it works. Anyway, today I did the ritual I had planned to retire my old wolf skin and dedicate the new one. Only a few folks showed up, but it was a good group, and it was a really successful ritual overall. I’ve got a full writeup and some pictures to share here–enjoy! He was my very first wolf skin, purchased in the late 1990s, and he told me before I went to my first pagan gathering that he wanted to dance with me. So I split him open, rigged him up with some leather straps to tie him to me, and we went out and danced at the fire circle, with great success! Since then, we’ve danced together around numerous circles. Sadly, I didn’t know much about taking care of hides til much later, and between rainy, damp nights in tents, and heat from the fires, he decomposed over time even though his was a pretty good quality tan. At some point I want to post a tutorial on how I got him from that to his present state, but now’s not the time. There are some items from the permanent Grey Wolf altar in my art/ritual room, along with my Black Bear rattle which I use to call and send home spirits, a fern frond and a turtle shell of water that I use to purify the ritual area prior to ritual, my ritual knife, and a platter with pouches for part of the ritual later on. You can also see the two hides curled up together, and a collection of spare musical instruments, as well as my own drum. I started the ritual with purification by sprinkling water with the fern, since I dislike smoke and therefore smudging. (Sprinkling water on people is especially fun depending on their reactions. I’m definitely keeping this!) I then called the various spirits and places of the directions to join us, along with a couple of other beings I wanted to invite, Grey Wolf included. Then I picked up my old wolf skin and carried him around the altar, talking about our history together, how he taught me to wolf dance, and some of the things we had been through. I talked about how it was going to be our last dance together, and that this was a very special event. Then I put him on for the last time, and while the other participants drummed and rattled, we danced around the altar. I could feel how tired and worn-out he is, but he made a good go of it, and we ended it with three good, long howls. Then I took him off, and I was crying as I did so. I thanked him one more time for the good years dancing together. I laid him out on the floor, and stretched out the new skin as well. I took the leather straps from the old skin and transferred them to the new skin, whom I had previously prepared. And then I danced the new skin. And I could most definitely feel the difference! This guy was ready and raring to go! We didn’t so much dance as run, leap, pounce, and gambol. (Yes, I said gambol.) It was tough at times to get him to stay focused on the dancing, which was fine–I’m just glad he was so happy to be moving around again. There’ll be time enough to work out etiquette between us. It was good, though, and I’m looking forward to the fire dancing next weekend. We then took a break to chow down on the potluck goodies people had brought, and enjoy some social time. After that, I had people bring the small leather pouches I had given them, and I cut off small bits of fur from both wolves and put them in the pouches. Mind you, I never give away fur from my personal wolf skins, so this was a really unusual thing–those who got them received very special gifts. And then I closed down the ritual, said farewell to the assembled (both corporeal and otherwise) and went to ground. You can see the Brown Bear altar beneath it, and also some assorted ritual and art effects on the floor at the base. No surprise, I’m already running out of room on the Wolf altar. It takes a very large wolf skin to be able to fit over my 5’4″ frame like that. It’ll take some time for us to adjust to each other; I need to fit the straps properly, and add a couple of others. Also, my arms do fit through the holes that his forelegs went through on the front leg skins, but it’s a tight fit. It’ll loosen over time, though. Still, he fits nicely like my old skin did, and we were very comfortable dancing together. Also, small bit of timing–my period started in earnest while I was dancing the new skin. Given that the moon is waxing, and Artemis has recently come into my life again, and I am a Luperca in the Ekklesia Antinoou it’s an interesting series of convergences to note. Today was the ritual for Grey Wolf. I hadn’t even consciously planned the ritual for today; I just chose a date that seemed convenient. Just so happens that tonight is a blue moon, and the Wolf Moon, or so I was informed. Which is funny, because I inadvertently scheduled the Brown Bear ritual on a full moon, too. I collected what little wolfish knickknacks I still have and put them on the altar; I’ve gotten rid of most of them over the years as I’ve downsized my collection of shiny objects. There was also the wolf skull that hangs with my collection, and a deerskin painting I did a number of years ago. The beadwork strips are the first two I ever did, way back in high school in the mid-90’s. That actually gives Wolf a connection to my artwork, since that all started with the beadwork (which I no longer do). The long green and brown thing with the bone spike on the end is a hair wrap I wore for a year, and there are a couple of other random things on there. And the wooden plate has the little gift pouches I gave to the participants. You can also see the Arctic wolf headdress and tail I wear when journeying, and the full wolf skin I’ve danced with for most of a decade. There’s my big drum, and a couple of spares, as well as the elk bells I made last year. Between the drums is the wolf fur coat that’s part of my costume, to be worn (of course) if I get cold. The blanket that covers the altar is just temporary, until in the spring when I retire my old wolf skin to altar guardian duty. So once everyone got settled in, I did a brief explanation of what I was doing there today. I explained a bit of the context of why I’m creating therioshamanism the way that I am, with the cultural context and why I’m trying to revive performance rituals as an art form as well as spiritual practice. Then I picked up my drum and began to warm it up, explaining to people why I was doing that. So then Wolf sent me back and said s/he’d follow, even though she knows the way quite well. When I got back and cooled the drum down, I then told the other folks there that now, instead of just drumming along to my single-note journeying beat, we got to do fun drumming! 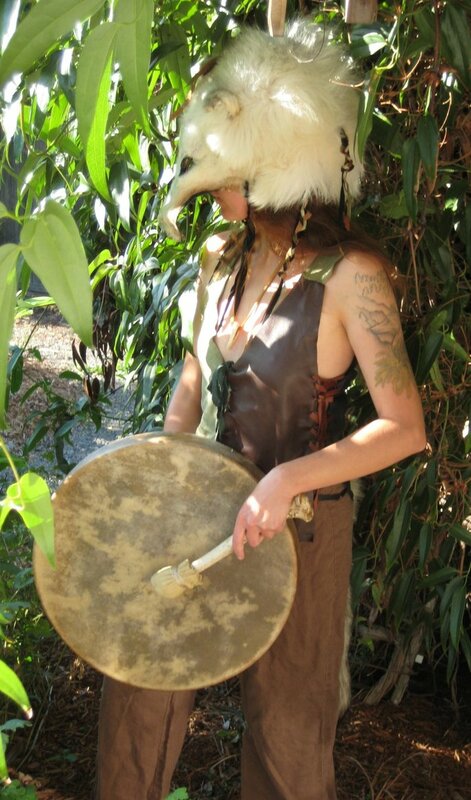 They began drumming, and I put my wolfskin on and began to dance (after taking the journeying headdress and tail off!) It was a bit of a sad event for me, since it would be the last full dance I’ll be doing with that skin. We slid into each other’s energy has we always have, and while the dance was indoors in a relatively small space, it was a good one. While I could wish for a place to do outdoor dancing around a fire on a regular basis, for now, the living room works. Once I was done dancing, and while we still drummed, we talked some about what Grey Wolf was to us, our relationship to that totem. I also spoke a bit about my wolfskin and what we had done over the years. Then we took a break to enjoy the various edibles people had brought and ground a bit. Finally, I closed down the ritual, thanking Wolf and the other spirits who had been there for their presence. There were offerings a couple of people had brought that I added in. The wolf skull went back to its usual place on the wall near the altar, and the various skins went to their homes as well. One of the things I noticed is that I enjoy throwing in little bits of explanation for why I do things as I do them, just to give people an idea of the reasons for things. I think I may make this more of a regular feature of the public rituals. And it’s tougher to build up a good atmosphere for this sort of ritual indoors than it is outdoors, or in a space that is specifically designed for ritual work. But we work with what we have, and I’m sure I can tweak things to create a better setting as time goes on. While I’m very good at individual ritual, group ritual is still new to me, and so it’s going to take practice. But overall, it went really well, and people seemed to get a lot out of it. Grey Wolf was pleased as well, and is happy to have a formal “home” within my home now. Today I led my first “official” group ritual as a practicing (neo)shaman. Brown Bear has been nudging me to try out some of the ritual techniques and practices I’ve been developing over the past few months to see how they’d work out, and s/he said s/he had wanted a ritual hirself, so this was a good opportunity. I put everything together pretty quickly since it’s getting into hibernation time, but it all worked out. The hide covering the altar is an old skin, possibly bear but not entirely sure, that was left on my porch at our old place–we think we know who it was. It’s incredibly old, just about falling apart, probably from somewhere in the early 20th century. The other hide, the bearskin in the foreground on the second picture, is my ceremonial skin–she was an oooooold rug I got at an antique shop over a decade ago. I removed all the rug stuff, and while she’s very delicate, some mink oil helped to rehydrate her. Still, she’s many decades old, and I have to be very careful with her. There’s also a rattle made from a black bear skull and a deer leg bone that I use to call in the spirits, and a deerskin bag that holds some of my other Brown Bear items. 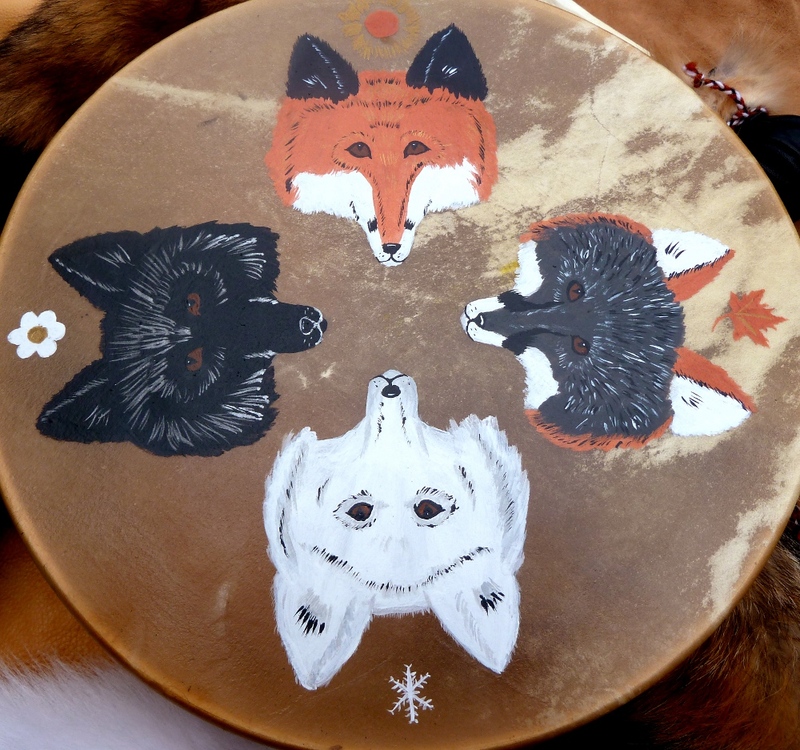 The plate in the center has small Bear packets that would be given out during the ceremony. Leaning against the altar are my big drum, a small drum that was my starter drum but is now a spare, and the elk antler bells I made a while back. And the white fur is the wolf headdress and tail that I wear while journeying, as I journey as a white wolf. There’s also a very small bear statue on there, along with a packet of small bear fetishes leftover from making the gift packets for participants. There ended up being seven of us total–me, Taylor, the three practitioners that I took on as students a while back, and who are now going off in their own unique directions with the material, and two other folks from the local pagan community who wanted to attend. I began with rattling in the spirits that I wished to have in attendance, calling them each by the name they wished to be known by. I didn’t call in everyone, because not all the spirits would have been a good fit for this ritual. Black Bear also helped to let me know who to welcome. I then warmed up my drum, rubbing it with my hand and then with the beater. After that I called the horse spirit of the drum with a specific beat that I use. Once that spirit came out of the drum, I began the journey drumming, and I asked the rest of the participants to drum with me to help me get to where I was going. I had journeyed to see Bear the day before to take hir a preliminary offering and to check in with hir about last details for today, but I didn’t want to make the assumption that s/he would automatically come to the celebration we had set up for hir. So I went with my bearskin spirit, and once we got to Bear’s den, I asked everyone to stop drumming since they had gotten me to where I needed to be, and to simply listen as I told what I experienced as it happened. The bearskin spirit and I went down cautiously into Bear’s den, even though we had been there before. Bear was there, and grumbly because s/he was sleepy. I very carefully asked hir whether s/he would like to come with us to the celebration and to see the gifts for hir, and also to place hir energy/scent on the bear packets I had made. S/he grumbled some more, and then told me that if s/he was going to show up, I would have to dance for hir, wearing the necklace I had made for hir before. The bearskin spirit and I then retreated. I had been keeping the drumbeat slow and quiet throughout all this, trying to keep myself calm, but turning my back on Bear was frightening, and I fought to keep the beat slow and quiet as we went back up to the surface. The horse of my drum carried me back as the participants all drummed and rattled again to help bring me back home. Then they drummed more as I carefully draped the bearskin over me, put the necklace on, and danced like a bear. It was odd, because I’m used to wolf dancing up on my toes (and I also walk on my toes as a matter of course), but bear dancing required me to stay on my heels. Plus the movement is much different, a larger animal, with a different heft of momentum. Then once that was done, I thanked all the spirits for being there, most of all Bear, and we drummed for them a while, and I danced as I drummed. Then I rattled them back home, and saw the attendees out. Overall, I think it went really well. I was nervous as hell, but managed to keep myself focused on the ritual itself. The feedback confirmed that others enjoyed it, too. One of the things that concerned me is that in neopaganism group rituals usually involve a lot of participation on everyone’s part. The whole spectator thing is often considered to be “boring”, or so I had feared. But as a performance ritual, this seemed to work out really well. The other thing I noticed was how quickly I got to my starting point with the help of everyone else drumming/rattling! It was like having a huge push behind me as the horse carried me there. Between that, and Bear’s den being very close to my starting point, plus it being a pretty straightforward, mostly pre-arranged task, the ritual itself didn’t last too long, under a half an hour [ETA: the portion prior to the food, I mean]. But it was strong, and I know I’m on the right track with this. There’s some fine-tuning that needs to be done, and things will get better with experience, but for a first time out, I’m really pleased, and everyone else (including Bear) seemed to agree.